Travel supplies are a necessary part of any trip budget. While some of them are going to cost a pretty penny no matter what you do, others are available at prices well below what you’ll pay at specialty stores. For adventurers on a budget, here are my five favorite – and cheap – places to buy travel supplies. Personally, I’m a huge fan of s-hooks for extra storage and hanging support in public restrooms, hostel showers and exposed poles on tuk-tuks and other forms of international transportation. You simply hang a large-curve hook over the top edge of a door, knob or pole and use the other end of the “s” to hang your toiletry bag, backpack, or purse. Best of all, they take up very little room. Door stoppers are also great items to pick up at hardware stores and can provide extra security when you are trying to keep a door closed from the inside. Electrical adapters cost only pennies and are fantastic when it comes to providing multiple plug-in options from a single outlet at the airport. You don’t have to be that annoying traveler that hogs multiple plugs. You just need to find one and you’ll be able to charge multiple pieces of gear. If one isn’t available, then it isn’t a huge stretch to ask someone if you can unplug theirs for just a second while you put the multi-outlet adapter into place. Then they’ll have their electricity, and you’ll be ready to roll as well. Carabiner clips are also helpful for hanging and attaching one piece of gear to with another. Dollar stores are a gold mine for the budget traveler. Cheap sunglasses and eyeglass repair kits, zippered mesh bags for organizing luggage, and affordable umbrellas are all items I have purchased from dollar stores on numerous occasions. Also of note are the two-packs of rain ponchos, transparent zippered pencil cases to store chords and other small office supplies flat and efficiently, and a variety of word puzzle books to keep you and the kiddos entertained. Seriously people, the dollar store is where it’s at for travel supplies. Check it out. If you don’t need something that has to stand up to Arctic temperatures or work at three hundred feet below sea level, then you might want to check out your humble local department store. 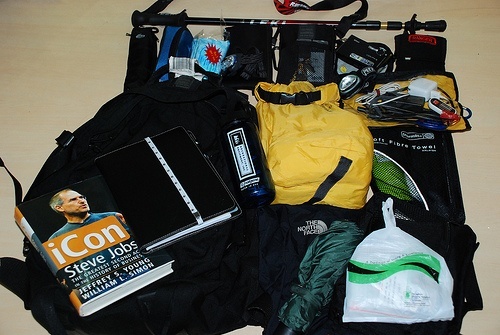 Many of them now have a travel aisle with basic gear that costs a fraction of what you’d pay at expedition retailers. Items of note are luggage locks, packing cubes, hanging toiletry bags and security pouches. Also consider hitting the school and office supply aisles for writing supplies, and picking up re-sealable food bags to use for meeting that one-quart limit for liquids at the airport security checkpoints. My husband and I have picked up travel coolers, large suitcases, daypacks and zippered totes at second-hand thrift stores in both Europe and the United States. We also got a number of items for an around the world trip at a military surplus store in Tucson. They had loads of small camping items that could also be used for long-term travel, such as mosquito nets and ear plugs. Cargo pants are also great to take on trips, as you can store items in the extra pockets that would otherwise take up room in your pack. This leaves you more room for tech gear and personal belongings in your larger pieces of luggage, while still being able to take everything on board with you in the allowed carry-on limit. Online retail is big business, and the competition is stiff. This is great news for those looking to score a bargain on basic travel supplies. I’ve ordered compact travel clothes lines, small head lamps, specialty footwear and more on the internet and had those items delivered conveniently to my home without the stress of driving around to search at various stores. Free shipping, discounts and online coupons are commonly available for the online shopper. So, search around. You never know what you might find for deals. Travel supplies don’t have to cost a fortune. By selecting the right stores at which to do your shopping, you can save big while getting ready for your trip. Hey, that just means more money to spend on all those fun things to do, right?